John Heartfield (born Helmut Herzfeld; 19 June 1891 – 26 April 1968) was an artist and a pioneer in the use of art as a political weapon. He is held in high esteemed as a pioneer in the world of photomontage with his intricate approach to manipulating photographs and the impact it had on the political landscape of his time. Some of his photomontages were anti-Nazi and anti-fascist statements. Heartfield also created book jackets for authors such as Upton Sinclair as well as stage sets for such playwrights as Bertold Brecht and Erwin Picator. If you ever wondered what inspired Sakevi of G.I.S.M.’s collages and artwork, you will find the answer in this book, which provides a comprehensive, opulent overview about his works along with informative essays that contextualize his emissions, one hundred and fifty of which are depicted in their original and the printed versions and were put together and derived from the collection of David King (known from The Commissar Vanishes, Red Star over Russia and Russian Revolutionary Posters). Needless to say that roughly seventy years after Heartfield’s heyday, his oeuvre still exudes the same intensity and is as relevant as it ever was. With the original Marquette being displayed on one side and the corresponding AIZ cover on the other, it allows to reader to view the many artistic nuances of Heartfield's work that are lost in the mass reproductions. 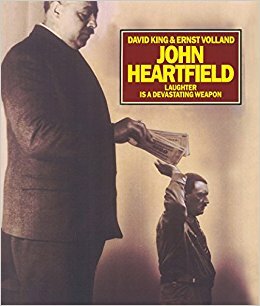 An absolute must-read for anyone with an interest in collage art works in general and John Heartfield and his work specifically.